Microsoft Works was an integrated all-in-one office suite available for the Macintosh, DOS, and Windows. It includes a word processor, spreadsheet, database, and communications program. These were smaller, scaled down, programs compared to Microsoft's other office products. It was sold as a lower cost suite targeted at home users. Microsoft Works competed against integrated office suites such as Lotus Jazz, FrameWork, AlphaWorks/LotusWorks, PFS First Choice, and many others. I'm not aware that there were any releases under the Mouseworks name. It seems it was acquired by Microsoft shortly before release. And from the sound of it, primarily to compete against Lotus Jazz on the Apple Macintosh. The first release was in 1986 for the Macintosh. One very interesting thing about it is that some bits were written by the same person who wrote AppleWorks for the Apple II. In some indirect ways, Microsoft Works on the Mac does feel a little like the old Apple II AppleWorks. Perhaps even more so than ClarisWorks , that Apple later officially re branded as "AppleWorks" on the Mac. 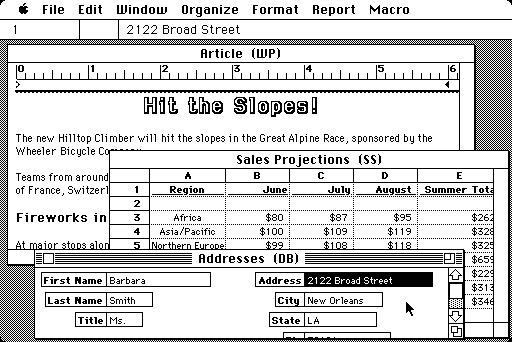 Oddly, Wikipedia says that the first version of Microsoft Works for Mac was 2.0, but that is not correct. There was a "1.0" disk set on eBay a while back, and Winworld now has 1986 manual scans although not disk dumps. The manual and registration card clearly call it "1.0"
Wanted: 1.0 for Mac disk dumps. Another interesting thing is that earlier Microsoft Works 1.0 for Macintosh disks were apparently copy protected. The 1.0 manual set we have has a leaflet stating that the disks that would have been with it had dropped the copy protection. This means the earliest 1.0 Mac disks must be dumped with a Kryoflux or SuperCard Pro. The thing that always boggled my mind about Microsoft Works is that it had nothing at all in common with Microsoft Office, and even competed against it. Some much later Microsoft Works versions bundled Microsoft Word to make up for the word processor's incompatibilities and shortcomings. In the ~1986 period when it was first released, small, inexpensive, integrated office suites were hot topics. Microsoft did not have any office products for Windows yet. Word and Excel on the Mac were brand new. MS-DOS was stuck with a text-based Microsoft Word and Multiplan. They didn't really even have a database unless you count Microsoft File. Even though it competed against Word and Excel on the Mac, at the time it made some sense to have a direct competitor to these all-in-one suites. It made a bit more sense when Microsoft, about a year later, released a port for MS-DOS. 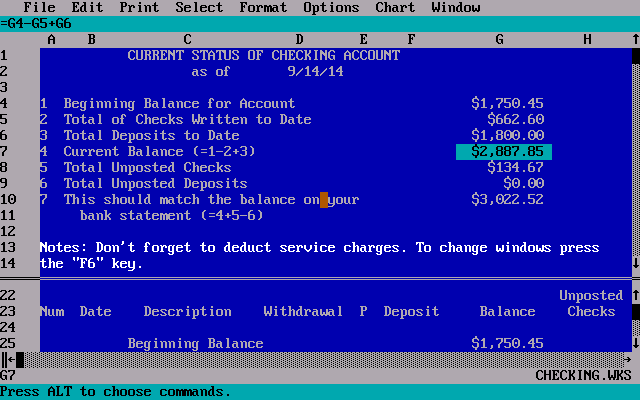 DOS was still stuck with a text-mode Microsoft Word and Multiplan. 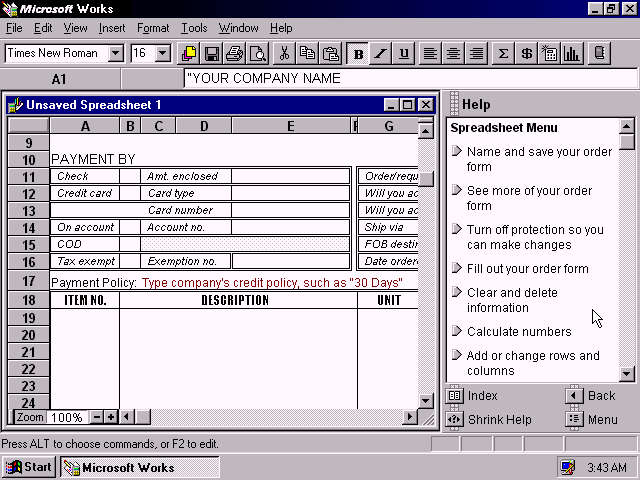 Microsoft Works 1.0 for DOS was sold as a lightweight product suitable for laptops, and sometimes bundled with OEM hardware. 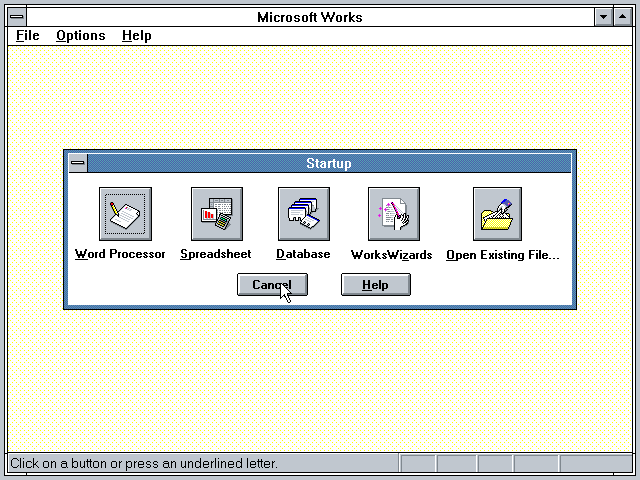 Finally, in 1991, Microsoft released a version of Microsoft Works for Microsoft Windows 3.0. It appears the first Works for Windows release was labeled "2.0" to match DOS and Mac releases. Works was later ported to 32-bit Windows 95/NT and continued to be sold as a lower end office suite. But frustration with the product increased as people began to depend more on Microsoft Office document compatibility. The last version of Works for DOS appears to be 3.0b, and the last version for the Macintosh appears to be 4.0. Microsoft Works for Windows was discontinued in 2007, with the final version being 9.0. Coincidentally, the revived (Claris) AppleWorks for Mac was discontinued the same year. Microsoft Works found some solace in mass OEM bundling as part of the "Works Suite" in the late '90s and early 2000s. This included Works, an older version of Word, Encarta Standard, Streets & Trips, Money, Picture It! and eventually a PowerPoint Viewer. Today, in its place are trials for Office applications. Incidentally, I found an incomplete copy of Works 1.0. Since it is significant enough I have added it here: https://winworldpc.com/product/microsoft-works/1x-mac Of course if anyone comes across a full origional set, a redump would be appreciated.